Doctors often miss signs of heart attack in women. 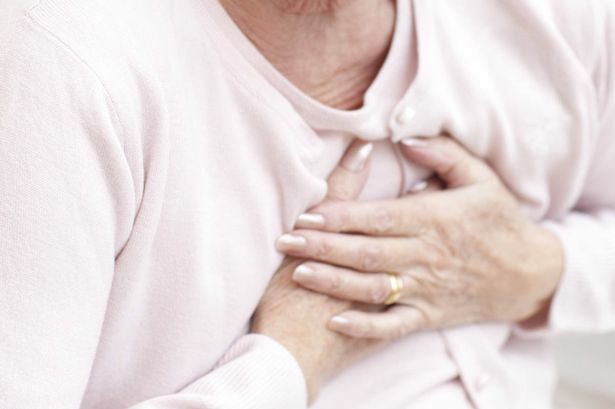 Tens of thousands of heart attacks are missed in women every year, a British study has found. A third of women are given the wrong diagnosis, and doctors fail to treat women in time because they do not realise that "middle-aged blokes" are not the only people to suffer heart attacks, researchers said. About 68,000 British women suffer heart attacks each year and researchers warned that palpitations or even a "funny turn" could be a sign. While men are more likely to have heart attacks, the study suggests a reason why they are more often fatal for women. Researchers at the University of Leeds used data on almost 600,000 patients in 243 NHS hospitals over nine years. They found that 35 per cent of women, 65,976 patients, were first told they were suffering from another condition, 50 per cent more than men after adjusting for age and other illness. Patients whose heart attacks were misdiagnosed were 70 per cent more likely to die, with 4.2 per cent dead in a month compared with 2.5 per cent of those given the correct diagnosis straightaway, according to the study published in European Heart Journal: Acute Cardiovascular Care. Chris Gale, who led the study, said: "Typically, when we think of a person with a heart attack, we envisage a middle-aged man who is overweight, has diabetes and smokes. This is not always the case." The problem begins, Professor Gale said, when women do not realise that they are having a heart attack. "It's not necessarily 20 minutes of crushing chest pain, it may be some chest pain and a funny turn, or a feeling of palpita­tions and a bit of chest pain," he said. "She doesn't recognise that she is having a heart attack so she goes to her GP, and then they don't call for an am­bulance so she ends up going to A&E eventually, and by the time she gets to see a specialist it's a late diagnosis." He also said that NHS staff needed to improve their knowledge. "Healthcare professionals need to be aware that we need to give all eligible treatments to females and we need to all be aware that females who suffer a heart attack are at risk of death," he said. "It's not just middle-aged blokes, it's older females who are sitting in the corner saying 'treat him with the broken arm first'." Another study by the same team, using Swedish data on 180,000 patients, found that women were 13 per cent more likely to die of the commonest type of heart attack and 50 per cent more likely to die of the other main kind, Dr Gale and his colleagues told the European Society of Cardiology congress in Rome. A spokeswoman for NHS England said: "We are working hard to continually improve tests for accurately diag­nosing heart attacks in both men and women so that correct treatment can begin without delay, ensuring the best possible recovery for patients. We are also working to increase awareness of signs and symptoms of heart attack."